If you are not familiar with the term onesie let me try to describe it for you. A single garment which combines trousers with a top and normally including a hood of some kind. Still not clear for you then think of Spiderman and his costume although he takes it to the extreme in covering his whole face to keep his real identity a secret. A onesie is not specifically for adults and was originally just worn by children. These days a one-piece leisure wear suit for adults is generally called a onesie whereas you might use the term romper for a child. Personally I have never seen the appeal of the onesie but many people do. They come in a variety of different styles but this article will concentrate on Pokémon, hereafter shown simply as pokemon, and specifically why adults like to wear pokemon onesie pajamas. For those of you that don’t know what pokemon is then the name is an abbreviation of pocket monsters which first appeared in one of the most popular video games of all time. Originally the monsters were created for the Game Boy and today the copyright for them is jointly owned by Game Freak, Monsters and Nintendo. There has been many different versions released but the idea is that you race through the video game searching out the monsters and then you train them. Originally there was quite a small number of monsters but that has grown over the years and currently stands at just over eight hundred. Some of the better known monsters are called Eevee, Celebi, Pikachu and Mew. I think we all know what pajamas are, or pyjamas as the Brits call them, so we are now able to ask why adults also like to wear pokemon onesie pajamas? Some of those that wear them will be massive pokemon fans and they have all the pokemon merchandise from mugs, coaster, hats and jumpers to beanies. 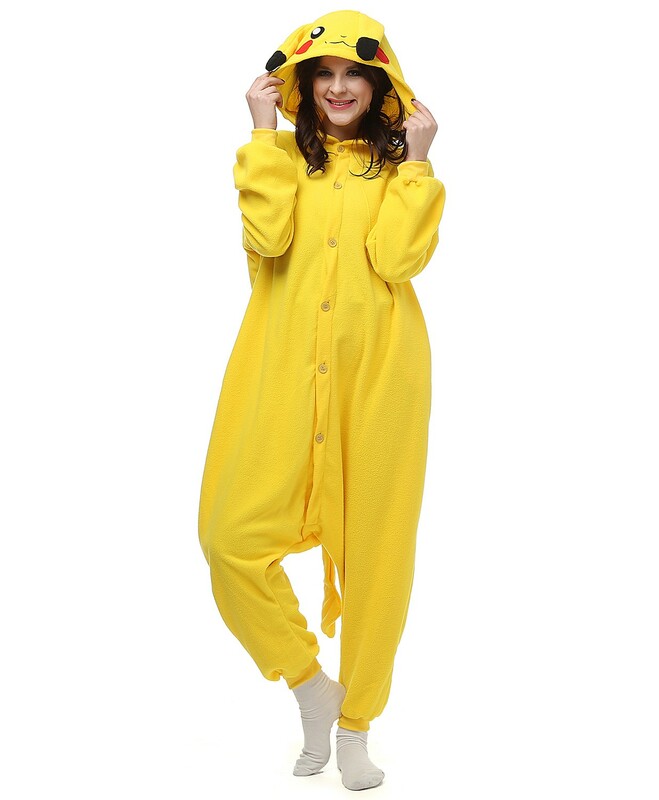 What better way of showing you are a pokemon aficionado than wearing a onesie of your favourite character. You don’t have to sleep in the onesie and some people just use them as leisure wear around the house. In recent years there has been a significant increase in people wearing fancy dress at different events, especially amongst young men. In years gone by it was acceptable for women to dress in mens clothes and other costumes but it wasn’t considered appropriate for men to be seen out and about in anything other than a nice shirt with jeans or trousers. These days men venture out wearing all types of costumes and the pokemon onesie pajamas are a popular choice for those looking for attention. It helps break the ice at parties and everyone recognises the loveable pokemon characters. Many wearers comment on how comfortable they are to wear and it makes their children happy to see mum or dad romping around as a real life, full sized pokemon. So for many it’s just a bit of light relief whereas others are so obsessed with these tiny fictional creatures that wearing one is part of their daily routine. Hopefully this article has helped explain why adults also like to wear pokemon onesie pajamas and you might now want to get yourself a pair.